Holden House toasts 31 years of hospitality June 9th! Innkeepers Sallie and Welling Clark recall 31 years and over 40,000 guests at Holden House. 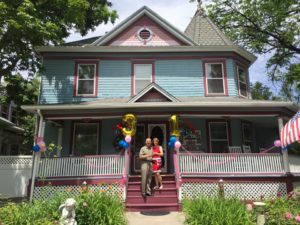 Colorado Springs, CO- This year on June 9, 2017, Holden House 1902 Bed & Breakfast Inn celebrated its 31st Anniversary of guest service in the B&B industry. An appropriate anniversary designation for an inn that has itself, received designation for the “Best Bed & Breakfast Inn for an Anniversary” by Arrington’s Inn Traveler Magazine. Holden House has the distinction of being one of the longest established B&Bs in the state of Colorado operated under the same ownership since Sallie and Welling Clark started the business in 1986. Other awards over the years include “Top 50 Inns in America” by Inn Times, “Best Inn Buys” from Bed and Breakfast/Country Inns Magazine, “Best of the Springs” from the Colorado Springs Gazette and “Best Of” from the Colorado Springs Independent, as well as numerous historic preservation and guest service awards from various organizations, including a coveted AAA Diamond rating. When asked what has allowed the Clarks to continue in the B&B innkeeping business, Sallie Clark says, “We’ve learned to adapt to the changing needs of the tourism and bed and breakfast industry while balancing our personal lives and employing a competent and dedicated innkeeping staff. The love of our community and sharing the Pikes Peak region with guests instills in us a continued appreciation for Colorado Springs”. Sallie Clark also serves president for the state bed and breakfast association (which she and Welling founded in 1987). Her husband, Welling Clark, works for a national defense firm and is a local neighborhood leader. Both successfully juggle their busy lives by being involved in the community and the neighborhood in which they live and work. 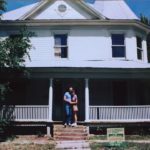 Holden House enters its 31st year of operation in 2017, maintaining the same ownership since first opening in 1986 as the historic Westside’s first B&B in Colorado Springs. Holden House offers six guest suites, each with private bath, sitting area, luxury accommodations and gourmet breakfast included. Special features include an optional ensuite breakfast, bubble bath tubs for two, fireplaces and private label amenities. Each of the suites are individually appointed with their own style; four poster bed, open Victorian turret, hand painted murals, private porches and more. The inn caters to those seeking a romantic getaway while also providing excellent accommodations for business travelers with free WiFi, color/cable TV and a convenient business center. Rates range from $145-180 per night. For more information on Holden House 1902 Bed & Breakfast Inn www.HoldenHouse.com or call 888-565-3980. The website also features information on inn specials and packages, favorite recipes and details on Holden House and the Pikes Peak region. An inn-tour video is included on the website and you can also find the inn on Facebook, Twitter, Pinterest and Instagram. This entry was posted in accomodations, anniversary, award winning inn, bed and breakfast, bed and breakfast inn, best, breakfast, food, garden, getaway, historic inn, holden house, Holden House 1902 Bed and Breakfast Inn, Holden House Bed Breakfast, hospitality, innkeeper, old colorado city, sallie and welling clark and tagged bed and breakfast, Colorado Springs Bed & Breakfast, holden house, holden house 1902 bed & breakfast inn, Holden House 31st Anniversary, Old Colorado City Bed & Breakfast, Sallie and Welling Clark by admin. Bookmark the permalink.